Plastic Services & Equipment is the North American full-service distributor of Baty Bore Gauges. The 20+ year alliance between our firms gives you the best possible product and services for your bore measuring needs. Baty bore gauges are an indicator type gauge used to measure the dimensional variation inside an injection molding or an extruder barrel. However, they may be used wherever there is an inner diameter that has to be reached to measure. HOW DOES A BORE GAUGE WORK? All models work on the proven principle of two diametrically opposed measuring points, one fixed and one moving, plus a spring-loaded centralizing shoe. Don’t waste your time and money on other inferior brands that do not use this proven method. WHAT A BORE GAUGE WILL CHECK? Dial bore gauges allow rapid and accurate checking of bores for: size, ovality, taper and wear within a deep bore. At any time your equipment is shut down and you want to check barrel for wear. It is recommended to use on a routine maintenance program that provides you with consistent recordings for knowing when barrel wear occurs and when it is time to consider replacing barrel. Note: To obtain correct bore measurements, the barrel must be clean of all plastic debris and be cool to ambient temperature. Barrels measured at elevated processing temperatures must factor in Linear Coefficient of Thermal Expansion (LCTE) variables. Instrumental to any predictive and preventative maintenance programs is the use of a bore gauge for barrel bore measurements. Most plastic processing companies have specified within their ISO-9000 or QS-9000 Quality Systems that periodic inspection of barrel bores is required. By periodically taking wear measurements down the length of the barrel bore, a pattern of wear can be determined. Once the data is recorded, an overall pattern of Mean Time to Failure (MTF) can be projected. This course of action will allow plastics molders to plan and schedule maintenance downtime on a machine before the machine is unable to make quality parts. For more information regarding how to establish a Preventative or Predictive barrel measurement program, please contact us at 1-800-627-1033. Easier and convenient to use, in a word Simplicity. Some bore gauges can be time consuming to setup and to use. 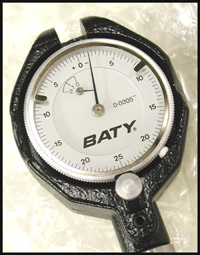 The Baty gauge has been specifically designed for ease of use. Typical setup time to measure a barrel bore is less than 5 minutes. Inspection time to fully measure a cylinder and record the data is less than an hour regardless of barrel size. And disassembly and storage of the gauge will happen in less than 5 minutes. In just over an hour per machine you will collect and be able to analyze data on the barrels wear patterns that will determine your repair or replacement options. Baty Dial indicators are recognized throughout the world as quality measuring instruments. Measuring equipment, like a production plant, must be continually improved to keep abreast of technological advances. There are a range of gauges that are used to measure a bore's size, by transferring the internal dimension to a remote measuring tool. They are a direct equivalent of inside calipers and require the user to develop the correct feel to obtain repeatable results. The gauges are locked by twisting the knurled end of the handles, this action is performed to exert a small amount of friction on the telescopic portions of the gauge. Once gently locked to a size slightly larger than the bore, the gauges are inserted at an angle to the bore and slowly brought to align themselves radially, across the hole. This action compresses the two anvils where they remain locked at the bores dimension after being withdrawn. The gauge is then removed and measured with the aid of a micrometer or Vernier caliper. They require a slightly different technique, the small hole gauge is initially set smaller than the bore to be measured. It is then inserted into the bore and adjusted by rotating the knurled knob at the base, until light pressure is felt when the gauge is slightly moved in the bore. Measurement is again by external means. Both Telescopic and Small Hole gauges fail to meet the needs of proper bore measuring because they are difficult to obtain accurate and repeatable measurements and they do not allow for full bore length measuring. They are only capable of measuring one spot at a time and cannot show the user if there exists pattern wear that only a continuous measurement can display. A Baty bore gauge is supplied complete for comparative measurements of bores falling within its specified capacity, typically 7/8” (22mm) to 6” (153mm). Gauges for measuring even larger bore diameters are available. Absolute measurements of bore size are possible by setting the bore gauge to size, using a bore of known diameter or measuring the distance between the fixed point and the moving point using a calibrated micrometer. An easy to read dial indicator is mounted at the remote end to measure the axial movement of the measuring head. There is a range of interchangeable anvil pieces (extension rods) that transfer the measuring movement to the dial indicator displaying bore deviation. Adjust the extension rod as necessary so that the gauge will enter the bore and the dial indicator registers. The two contact points on the spring-loaded shoe "A" and the fixed-point "B" form a 3-point contact which centralizes the gauge in the bore. There is no need to grip the gauge firmly and no attempt should be made to influence its position across the bore, as it will centralize itself in this position. If the gauge is rocked very slightly backwards and forwards so the points "B" and "C" cross the diameter of the bore, it will be seen that the indicator hand moves to a minimum reading and then returns. This minimum reading indicates the position at which measuring points "B" and "C" are correctly on the diameter of the bore, and all measurement readings are taken from it. If plus and minus readings are required, adjust the extension until the "minimum" reading occurs, roughly midway in the range of the dial indicator. Should the full plunger travel be required in one direction, adjust the extension until the indicator registers just at the beginning or end of its travel according to the direction required. Lock the extension securely with the nut. The indicator with its shroud can be adjusted on the body of the gauge if socket-head clamp screw "H" is loosened. Using this adjustment and the rotatable bezel of the indicator, the hands and main dial can be positioned wherever required within the range of movement. To inspect a bore merely for out-of-roundness, taper and other variations of shape, or wear, without using a master, set the indicator to zero at one position in the bore and then take readings at other positions. The gauge can be set in a bore of known diameter, preferably a ring gauge of the size to be checked. With care, the gauge can be set by outside micrometers or by slip gauges in a holder. Remember that unlike a bore, micrometers and slip gauges have flat faces, and the setting must therefore be square to these faces. Baty bore gauges are manufactured for continuous use, but must still be treated as a fragile quality measuring device. Standard maintenance of the gauge should be performed every 3 months or 1,000 bore measurements. Please do not attempt to disassemble your bore gauge. For repair, maintenance and calibration services, contact PS&E at 1-800-627-1033. Please do not attempt to disassemble your bore gauge. If a component on your bore gauge wears or breaks, PS&E has replacement parts to service and repair. While some components on the gauge are non-serviceable, all components can be replaced at a considerable cost savings over purchasing a new gauge. For information regarding pricing and availability of repair components and service, call PS&E at 1-800-627-1033. As per most ISO-9000 or QS-9000 Quality Systems, yearly inspection and calibration of all measuring equipment is necessary. When the time for this inspection occurs, contact PS&E at 1-800-627-1033 for quotation of inspection and calibration. Your bore gauge was shipped in a special impact resistant wooden case. This is where bore gauge should be kept when not in use. This gauge does not require special environmental storage. Any clean, ambient temperature environment will be satisfactory. Do not the store the gauge where it can come into contact with large amounts of dust or moisture. The Baty precision bore gauge is designed for continuous and repeatable use. With proper care and maintenance of the gauge, it has a useful life that can exceed 10 years.